Welcome back everyone to a very different session. In our last workshop I asked for people to submit their questions about poetry and poetry editing. So lets get right to it. When I read these, I see truth in all of them. Then I read them again and see the arguments against. The most we can say is that, here, even from some of the greatest poets of all time, all they have given us are personal opinions of what poetry is to them. The simplest definition of poetry I’ve ever heard lies in the distinction between prose and poetry. It is one of form: prose is based on the paragraph whilst poetry is based on the line. This should be no surprise as use of the line is one of the key areas of focus in the writing and editing of poetry. Back in the third session of Editing 101 I talked a little about avoiding making value statements in poetry or running the risk of coming off like an absolutist. Statements which are clearly opinions or beliefs are fine, but many people find it intolerable when others represent these personal positions as facts. So above and beyond its form, I’d be wary of anyone who tries to tell you what poetry is. Poetry has evolved throughout history and has always found ways of reinventing itself. Even if you could pin it down, it’s likely a young poet will come along and do something which forces you to redefine your terms. Anyone who’s trying to strictly define it is playing a losing game, because they’re giving up all the possibilities of what poetry could be but isn’t yet. In modern free verse, how much does pattern and structure or lack of it matter? This is going to be a somewhat contradictory answer because it matters a great deal within the poem but it doesn’t matter at all in terms limitations or restrictions to the poem because we’re not forced into following a predefined structure. When writing free verse we can essentially make all the choices ourselves about the structure of the poem: whether it has elements of regular rhythm or not, whether it uses any rhymes/pararhymes or not – in any part of it or at particular points, whether there is symmetry in the length of lines, of stanzas. All of these elements and much more are up for grabs. My reading of this is, these things are important, if not essential. What writing free verse actually gives you is the chance to make everything work for the poem in the most powerful way possible. If you feel lines should be long at one point and short at another, if that’s going to make the poem stronger then you absolutely should do it. If you want to use a rhyme to amplify a line, then you can do that too. Robert Frost said, Writing free verse is like playing tennis with the net down. I’m still unsure if that amounts to a positive or a negative, though for Frost it was definitely the latter. It’s quite a flawed analogy when you consider it, because playing without a net wouldn’t make the game any easier to win – the opponent would have all the same new advantages – it would merely change the game and make more things possible. I have seen some people experiment with indentation in pretty unique ways. Do you have a general opinion on indentations – if they are helpful, distracting, or depends on a case-to-case basis? I guess as a reader and writer of poetry I’m quite old school about this issue. I feel that unless justified by the content of the poem itself, poetry should be justified left, and that’s about it. Where anything else is going on with the physical structure of the poem it should be to enhance what’s on the page. Let me give you an example of what I mean. Take a look at this poem by Jon Silkin, Death of a Son. In the very last verse, each line is left justified – the son is dead. Left justified text – justified – the last verse forming a justification of sorts for the rest of the experience. This could be read in many ways – pain has been lifted from the son and/or from the persona, or perhaps he feels his son’s spirit rising up out of his body. It’s probably worth pointing out that Silkin was one of the foremost poetry editors of his day. He founded and was the editor of Stand magazine, which is still one of the most important poetry journals out there. This particular piece shows what is possible with the structural games that can be played in a poem. The question we should ask ourselves is this: do the structural decisions we’re making serve the theme and deep meaning of the words on the page. If not, go back to basic formatting. The words of a poem should do the talking. When I see poems structured with indents, or spaces within a line to form curves or shapes on the page, it starts alarm bells ringing. In the right poem it can be magnificent; if its not justified within the content of the poem, it’s a clear signal that the writer knows their words can’t stand on their own and has felt the need to pretty them up in entirely the wrong way. I know this person who wants to improve on their poetry but refuses to change any cliches and old English in her work. What advice should I give her? For a start you could direct them to last Editing 101 post in the series. Though I’m guessing this is more about advice falling upon deaf ears more than anything else. When you read the work of a writer and it’s ridden with cliches, abstractions and antique language, there’s no clearer sign that they’re not reading contemporary poetry. Such writing feels stuck in the past because that’s clearly where the writer is. So encourage them to read some. Make them a present of a modern poetry collection or get them an anthology – something like Staying Alive would be perfect for this. The other possibility, especially when it comes to cliches and abstractions (if that’s a problem too), is that they’re just novice writers who believe that their first drafts are good enough. If you feel this might be the case, try and get them to join a writing circle or perhaps go to a workshop with some experienced writers. I hate writing and I rarely read long poems. I like writing 3 to 5 lines of words with great depth. Any advice on that? I think short poems can be as powerful as long ones. I don’t see very much different in the disciples between writing them. In a short poem the features and concerns are very must the same as with a longer one. Another key element of writing and editing poetry is conservation of language and short poems emphasise the need for this aspect of the craft. This will be the subject of an entire session coming up soon, so I’ll not say more than that at this point. As for not engaging with longer works, if you’re looking to expand into them, my advice would be to go back and look at the very first session and try following the process I’ve laid out there for the writing of a poem. Write five drafts of a poem and see how far you can explore within a theme. Push yourself to uncover new ideas and images and then synthesise all these drafts into a coherent whole. Either way, I wouldn’t feel any negativity about it. The quality of a poem is much more important than its length. 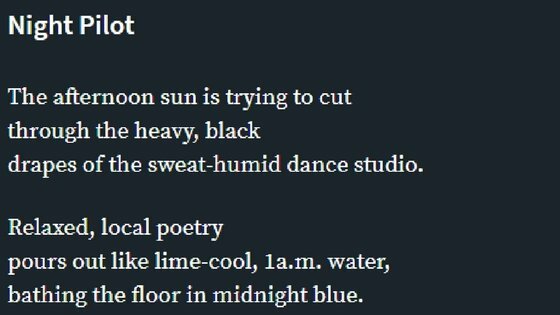 How do I format poetry on Steemit? What a great question. I guess everyone has found their own way but this is the method I use to make it look as close to professional publication as I can. This is from a poem I posted earlier this week. So it’s just a 3# header for the title, a line break and then the text of the poem. So it’s as simple as that. Don’t use the quoted text marker > It’s great for quotes but looks terrible for original poetry. This may sound like a ridiculous statement but it’s something else I’ve seen people do – don’t post your poetry in bullet points. It might actually be a nice texture for a poem if it were justified by the theme, but to do it as standard makes the poetry look terrible. Finally, do not center justify your poetry. Well, unless you want your poems looking like they’re being delivered on a greetings card. Is poetry that sounds like it’s prose chopped up actually poetry? So this one takes us to the beginning again and brings us back to talking about what is and isn’t poetry. One could see this on a sliding scale, of sorts, that poems, in some way, find themselves between the lyrical and the prosaic. In terms of modern poetry, there certainly has been a movement towards the latter in the last seventy years or so. Poems written in this way tend to have a more hard-boiled feeling. To give you an example of what I mean, take a look at this poem by Matthew Sweeney (one of my favourite modern poets): Gold. So then we can ask ourselves, would that poem be quite the same if it were couched in lyrical verse? No, it surely wouldn’t be. It’s raw and uncomfortable on the page and it needs to be so. Now let’s look at a more lyrical work: Molly Peacock’s, A Hot Day In Agrigento. The lyrical nature of the poem clearly forms a substantial part of what this work delivers. A colder style would change this entirely. This divide between beautified and matter-of-fact, elevated and earthbound, lyrical and prosaic are not really a divide at all. They’re a choice that should be made to serve the work and make it the best it can be. It’s another option, another texture, another possibility. It’s sad to have to admit, but there does remain a certain amount of prejudice about poetry from people who have a very fixed idea of it, often 100 years out of date. They will tell you that poetry has to be lyrical or it isn’t poetry. Please don’t listen to them. It’s only bias and ignorance talking. There’s absolutely room for both the lyrical and the prosaic. So there we are. Thanks for your question and thanks again to everyone who submitted one. In the next session, we’re going to be talking about the central, structural feature that makes poetry the form it is – the line. Before you go, please take a moment to give me a follow. It’s a great way you can help support the series and the blog. If you have any comments or questions about this session, or just want to say hello, feel free to post a comment below. drapes of the sweat-humid dance studio. bathing the floor in midnight blue. in an unexpected nocturnal rising. from the day baked streets. and Nox comes to life and speaks. Here’s the thing – I never used to like poetry. To be honest, I never used to dislike it either. It was an art form that simply passed me by. From time to time I’d read one somewhere, or hear one being read in some form of media or other, and, occasionally, I’d even think one of them was cool but I never looked further than that. Back in 2004, I was working in IT support as a support analyst. During a three week break between contracts I decided I’d try to write a novel. I wrote a 70,000 word fantasy yarn for young adults and decided that was it, I wanted to be a writer. I’d never been to university so I looked for ones which had creative writing programmes, and six months later, I matriculated into Ruskin College, Oxford. The very first seminar – poetry. In fact, it was the start of a term when all we did was look at and analyse poetry from a series of amazing writers. It only took me a couple of weeks of being there before I was checking out more poetry collections than novels from of the library. From that moment on, I was hooked. I read collections and anthologies and picked up pretty much anything I could find from Oxford’s numerous charity book shops. What was it that I liked about poetry? It’s hard to quantify entirely. I liked the concentration of language for sure and the way each poem I was reading set out to encapsulate a single theme. When it came to writing them, it was different from the novel work I’d been doing and a lot more exciting. I continued my love affair with poetry all the way through university and to the present day. I even got my first few poems into journals and anthologies. 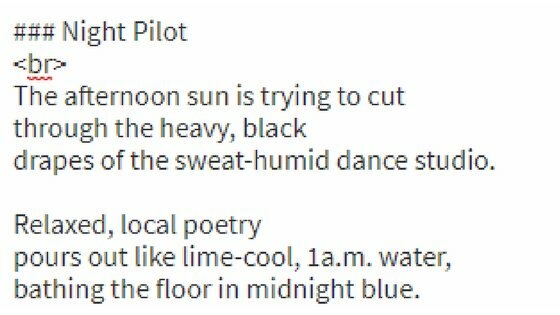 Cut to more recent times and I’ve been workshopping poetry on several Discord groups, but most recently, The Writers’ Block and Scribes and Scribblers. The latter was where I met Zo. A very smart guy who still posts there. He often makes what are commnly called, shitposts, for want of a better word. He has a fantastic mind and I tried to convince him he should turn his hand to poetry. So I took one of his shitposts and turned it into a poem for him. but I woke up recently. when western boys are dead? It was a while later, shortly after I joined The Writer’s Block, that @Nobyeni, our resident philosopher, made some passing comments about life, and it got me thinking – those of us who use chat rooms like Discord say cool things all the time which end up disappearing into the aether. So, again, I edited Noby’s words into verse. Noby liked it so much, she posted the poem. Soon after that I started editing them for anyone who said something fabulous in chat. People began posting them to Steemit, many of them pledging the SBD they raised to go to @tarc – a fantastic charity run by @rhondak – one of the admins at The Writers’ Block. @anikekirsten even created me this amazing logo for people to use when they posted them. 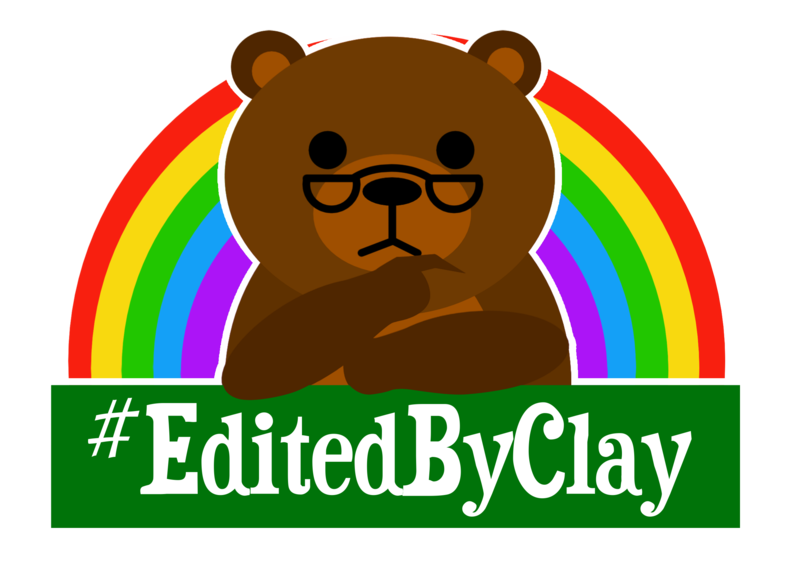 That’s how #editedbyclay became a thing. Then @bex-dk took it upon herself to start collecting them and now maintains a list of all editedbyclay poems at the Steemshelves which you can visit by clicking the logo above. There are many fabulous poems there so I’m not going to single any out. They range in style and voice from emotional to light-hearted, from deep and philosophical to tragic, to witty, to wistful. The words are those of the writers – not mine. All I have done is edit them. To believe your own thought, to believe that what is true for you in your private heart is true for all men, — that is genius. Speak your latent conviction, and it shall be the universal sense; for the inmost in due time becomes the outmost. good poetry is good poetry. It’s this simplicity and naturalistic voice which has marked all of these poems so far. Since I’ve started doing this, a number of writers in The Writers’ Block have been converted and have begun writing their own verse. So I guess it’s worked. I’m now also not the only person editing the words of others into verse. You can read more of this by searching out the #unintendedpoet tag. Genius is the activity which repairs the decays of things, whether wholly or partly of a material and finite kind. So really, this post is about #editedbyclay poems, in case you see them floating around. But, more than that, it’s about seeing the inner poet within ourselves and others. In communities like ours, where people often speak openly and honestly, without pretension, they say things that truly are genius – things worthy of being preserved – real poems. I guess that, sometimes, it takes another writer to show them. 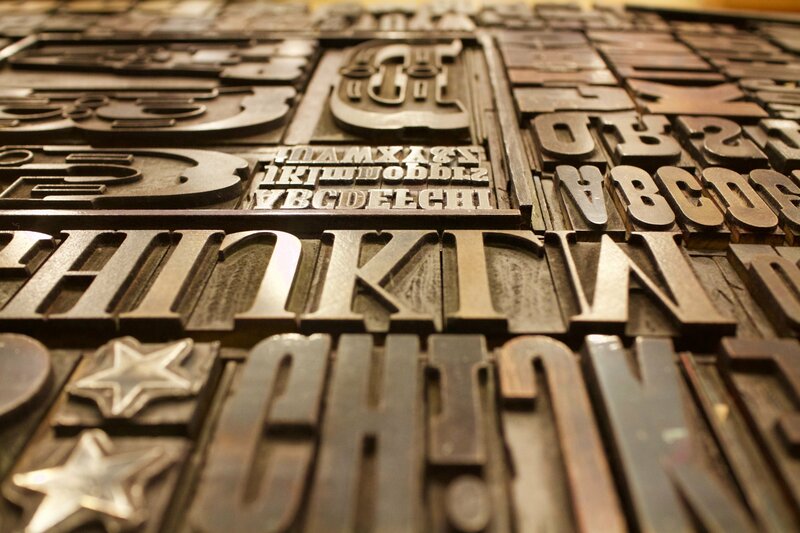 Not too long ago, in the days before computer technology took over, if you wanted to print something you had to produce a printing plate (forme), made up of individual letters. Assembling these took a great deal of time. If you were going to publish a book, it was a serious investment, and, once the print run had ended these formes were broken down to the individual components so they could be used again. But what if the book was a success and you wanted to publish more editions? Easy, you’d make casts of the assembled plates. These casts were called clichés, an onomatopoeic word describing the clink of the metal press as they were being produced; this is from where we derive the modern use of this word. A plate from which a print could be reproduced endlessly and without any variety came to describe a phrase or opinion that is overused and shows a lack of original thought. So, an overused phrase that we’ve heard time and time again. Let’s keep the image of the cast in mind when thinking about clichés and why we should avoid them. But why are clichés so bad? This is a good question, and answering it leads me to answer something about editing and this course in general – about why these rules and laws in poetry and writing exist in the first place. As a writer, there’s a fundamental question you need to ask yourself: are you writing for yourself or are you writing for an audience? Some people do write for themselves and there’s nothing wrong with that whatsoever. If you are writing for yourself you don’t need to follow any rules. You can do whatever pleases you. All the other rules are only about making that one thing happen. You can break any rule you like – but beware. Unless you’re doing it for the right reasons, in a manner which improves the writing, your readers may not thank you for it. Genius is the activity which repairs the decays of things, whether wholly or partly of a material and finite kind. […] So when the soul of the poet has come to ripeness of thought, she detaches and sends away from it its poems or songs, — a fearless, sleepless, deathless progeny, which is not exposed to the accidents of the weary kingdom of time: a fearless, vivacious offspring, clad with wings (such was the virtue of the soul out of which they came), which carry them fast and far, and infix them irrecoverably into the hearts of men. In poetry we generally seek to encapsulate a solitary theme, idea, or event in a concentrated and beautified form, immortalising and preserving it for eternity. We seek to explore this theme’s individual nature and peculiarities, its absurdity and ironies. Using a cliché is exactly the opposite of that. It doesn’t reflect the individual nature of anything. It’s weak, lazy writing, often caused by a real lack of development and exploration by the writer into the theme. Using a cliché is an admission of defeat. It is exactly like using a cast of work written by someone else, instead of looking for the best words we could be using. Whenever we see a cliché in our or anyone else’s writing we should hear the clink of metal ring in our ears like an alarm. So what do we do when we find we’ve written a cliché? Let’s look at a clichéd line and how we can resolve it. and we fight the good fight. I should point out, the only real way to recognise clichés is to read as much as you can. Then if you hear the metal clink of familiarity, you’ve probably hit on one. Black as night and fight the good fight are clichéd phrases that clink particularly loudly and will be familiar to most readers. Let’s rewrite them and make the poem stronger. The sky is now an inky bruise. We’ll draw, and serve our blood with cause. Here we’ve simply exchanged the cliché for images that say the same thing but aren’t entirely unoriginal. As well as this, we can also try rewriting the clichés themselves. The heavens are as black as fright. We’ll not cower from this bad fight. With the first line, we’ve kept the rhyming structure of the original cliché, but changed the wording into something new. In the second line, we’ve stated the cliché in reverse. Doing this really adds, because as well as being more original, it gives the reader the cliché as an intertextual joke. As I’ve said, the rules are there to keep your writing reader-focussed. There will always be times you can ignore them, like I will now by giving this clichéd piece of writing advice: first, learn the rules, then learn how to break them. For many of us, our first experience of grown up poetry is when we’re first handed some to read in secondary school. I think things have improved on this point recently, but for the longest time teachers didn’t think twice about handing students pieces written years ago using antique language. I think this might be responsible for two of the most common problems I’ve seen in the work of developing poets. First of all, it’s given some poets the idea that poetry should be complicated, hard to understand in need of deciphering. This may be slightly true if we’re talking about complex tropes and figurative imagery, which often need to be reflected upon as they open in the mind like the petals of a flower, but should never be true of the language itself. If a reader of poetry tells you they don’t understand a part of your poem then the problem is with the writing. In this case there’s little else to say. But, to show you that poets haven’t found the need to sound all 16th century for a long time, here are some examples of truly exceptional poems, dating all the way back to the early 1800s. But the main reason I think novice poets start to use antique language is because they haven’t actually read any modern poetry and, in their ignorance, believe that’s how poems should be written. It’s an artificial way of making your poem sound elevated – another way of employing a contrived poetic voice (a subject we’ll be returning to in later sessions). We should remember, we’re writing for a modern audience and should be using a modern vernacular. Yes, there are times we might want to use antique language in a comical or ironic way or as an actual theme for a poem. Just be aware that there’s a good chance you’ll alienate your reader. Next time will be a special post. I’ll be taking the session to answer your questions about poetry and poetry editing. If there’s anything you’d like answered, chat to me on Discord or leave a question in the comments below. Before you go, please take a moment to give me a follow. It’s a great way you can help support the series and the blog. If you have any comments or questions about this lesson, or just want to say hello, feel free to post a comment below. when you get up and go. You may ask – do you donate? or spray the nurse with a pint of sick. I can’t get past the list they tick. I lie about my sexual interests. My gayness causes them distress. Well being gay isn’t officially the thing. because I shag a Mr instead of a Miss. where straight guys don’t get HIV? the entire countries A and Es! which is another reason they won’t take it. June 1991 was a pretty lousy summer in all honesty. I was working in a really awful job at a supermarket while my primary set of friends had all gone to university. I was 19, guitarist in a goth band (though not a goth so I didn’t fit in at all). I’d reached the point in my life when I loved to be out and pubbing. But it was towards the end of that summer when everything turned around. I met some new cool friends who took me to the first nightclub I’d ever been to, which became my regular haunt – Chaos. I was a total metalhead at the time. The overproduced Hit Factory nightmare of the 80s had left me cold to the radio. Other than the John Peel show, my listening never really left the confines of Judas Priest, Iron Maiden and the bands you could discover by looking at the patches sewn onto my denims. On the very first night I went to this club, the sound of British Indie dance rhythms hit me harder than the smell of deodorant-laced sweat and stale beer. As the night passed, a non-stop wall of Manchester beats and American style Alt captured my soul: The Wedding Present, James, Thousand Yard Stare, Pixies, REM, Ned’s Atomic Dustbin and an ever exciting run of tracks by the freshest bands of the time. Chaos was down in the basement of a small bar on the Edgware Road. Always rammed, black wall to black wall, with original Indie kids. No matter what the temperature outside it was so hot in there that people’s sweat used to evaporate then condense and drip from the pipes running across the ceiling. When it rained, punters would stand under the open hatches above to cool down. They didn’t mind getting soaked – the entire place was a mangrove swamp. I’d been going a few weeks before I dropped my Metal persona entirely and started to get into this guitar music you could dance to. Then, one night, I’d just got a cheap bottle of cider from the bar and this track came on that opened with a dog barking in rhythm and drove everyone to the dance floor. It was Been Caught Stealing. Luckily enough, one of the guys who first introduced me to the place worked at a record store and was able to tell me the name of the band and album, Jane’s Addiction, Ritual De Lo Habitual. We have more influence over your children than you do, but we love your children. I threw the CD into my player, pressed play, sat back and closed my eyes. The opening track, Stop, was exactly the kind of thing I was expecting from this band – hard hitting, heavy rock guitars with an unconventional beat and my first clean taste of Perry Farrell’s voice, which had an almost unmusical Lou Reed sheen. I found myself half drifting off in the noise and excitement of the four tracks, in that way where a flood of one sense can overwhelm you into oblivion. Then came track 5, the one I’d first heard in the club but the first time I’d heard it pure. The half-syncopated funk drums and groovy, feel guitars blew me away even more. Then the album turned into something I wasn’t expecting: this deep, thoughtful and introspective second half where it chilled out and slowed down with Perry Farrell whispering the opening to Three Days. As the light shuddering of the train rocked me further into a reverie, this ten minute song grabbed me with its beautiful picked guitar opening and slow pulsing bass line in a song about death and rebirth that was totally matched by the form it took, eventually exploding into an astounding dynamite blast of emotionally expressive rock. It was the first chance I got to hear exactly what guitarist Dave Navarro could do, as I was blown away by his jubilant performance on one of the greatest guitar solos I’ve heard, even to this day. The second half of the album was all like this, and when I got off the train I felt like I had been changed. I felt like music had been changed. A few weeks before, I’d discovered Indie and it had been a revelation. This, though, was something that took all of those qualities I loved from metal and delivered them in a more real and emotional way. It was heavy metal’s spiritual successor and I knew it was going to lead to something magnificent. I knew it was going to influence some great things, but I had no idea at the time it was going to lead us to Pearl Jam’s Ten or Nirvana’s Nevermind, tracks from both of which I’d be hearing at Chaos for the first time before the year was out. It certainly influenced my band. When I got into indie I quit the Goth band and formed an indie outfit we named Chuck U Farley. That’s us below. After the Alt avalanche hit, totally sparked by Jane’s Addiction, we changed our name to Violent Dreams and took on a much more Alt direction. I’ve never stopped loving this album and it remains powerful and re-experienceable, time and time again. It’s one only people who were there seem to know, and doesn’t hold the rightful place in our culture that it should have, capturing a time when the Indie kids were young and beautiful and full of life and passion. It was a cornerstone of my generation’s Summer of Love and takes me back there whenever I give it a listen. They’d saved her from the streets of Moscow, and for what? To be chained down for five hours in this rapidly heating box with only this salty, empty jelly to eat? Blistering air hit her lungs. Her legs and body convulsed. Laika was the first space dog. She was chained inside Sputnik 2 before it was launched, with no intention for her survival. The world was told she was euthanized in space with poisoned food. This was not true. It was found out later there was a malfunction that caused the craft to heat up to the point where it killed her. This stamp commemorates her. between our own and sleep. all half a world away.